Last week a nerdier segment of the music world was abuzz with the news that an Austrian company Rebeat had taken a $US4.8 million ($6 million) dollar investment to help bring its "HD vinyl" records to market by mid 2019. Huh? HD vinyl? How does one make the last analogue music storage format (that people still care about) high-definition? It screamed pure marketing buzzwordship to us, but we consulted with some experts and surprise, it seems there's reason to be cautiously optimistic. One major problem that does exist about vinyl is that there's currently a major strain on manufacturing. There's been a re-explosion in popularity of records - vinyl record sales grew for the 12th consecutive year in 2017 - that the world's remaining pressing plants can't keep up with. Additionally, lacquers can only be produced in certain finite quantities, has led to serious bottlenecks in production. HD vinyl could help alleviate that strain - But let's back up. For starters, know that the HD vinyl record you buy will be materially the same as the records your grandpa bought, as in they will still be made of vinyl and you can still play them on a standard turntable with a standard cartridge. So, no, it won't be a DVD vs. Blu-ray situation. What makes HD vinyl different is the process that goes into making them. The process for making a standard record typically goes something like this. A master recording (frequently digital these days), is played through a machine that cuts a lacquer disk. That's basically like a one-sided record and should be the most faithful analogue reproduction of the original sound you can get. It will be inspected for errors by the engineers, musicians, recording artists, and what have you, and if it passes, then it gets electroplated. This is a chemical process that essentially gets metal (typically nickel) all up in the grooves of the lacquer. Once set, that metal disk is popped off and it's essentially an inverted copy of the lacquer disk. This is known as the "father" or "metal master" which can now be used for stamping hot, gooey blobs thus turning them into records. But that's not always what happens. The process of making HD vinyl is very different, and theoretically, far more efficient. For this process the sound file is turned into a digital, 3D topographic map of what the stamper's surface will look like. (This will probably piss off the purists, but according to Rebeat, 98 per cent of the music that goes on vinyl these days comes from a digital source file anyway.) That map is then laser etched into a ceramic plate, and presto, that's your final stamper which will then be used to press the vinyl blobs into records. There are a ton of advantages to doing it this way, and Rebeat's CEO Günter Loibl enthusiastically expounded them over email "…compared to traditional vinyl: the nickel stamper is the third copy of the lacquer, which means you press vinyls with the third copy. In our case the ceramic HD Vinyl stamper is the original - no copy!" Theoretically Rebeat can print as many stampers as it wants, too, without any loss in quality since they always come from the same digital source file. Loibl also told us that traditional vinyl stampers degrade the more records are pressed, which leads to a difference in quality between the first and last copy and a consumer never knows which he or she is getting. He said that HD vinyl stampers have no wear so the first copy is the same as the 10,000th. Of course, that all still remains to be seen (err, heard), but generally speaking ceramic is a lot harder than nickel, so it should be more resistant to deforming, but then again, ceramic is generally far more brittle, so we'll just have to wait to find out. From the listener side of things, the most definitive difference may be that HD vinyl will supposedly be able to cram 30-40 per cent more music onto an LP. That's a lot. We asked Loibl if they accomplished this by somehow making the grooves narrower. Turns out it's sort of the opposite. "30 per cent more content does not mean narrower grooves," Loibl told Gizmodo. "We just optimise the space between the groove. The size of the groove will be 100 per cent like on trad[itional] vinyl. We can even go one step further. Due to the high precision laser and wear-less stampers, we can provide what we call 'perfect groove.' The shape of the groove on HD vinyls doesn't change. So it will be possible to produce needles that fit perfectly into the groove, which is not possible yet. The additional content can be used for more volume or better dynamic or longer playing time or a combination of those three." We asked Rebeat's Loibl if these records would be more expensive for consumers. He said we should expect that it will be similar to any new media format that comes out. "At the beginning HD Vinyl will cost more because labels will charge more and stores will charge more. But once the catalogue of HD vinyls is big enough price will be nearly the same like for traditional vinyl." 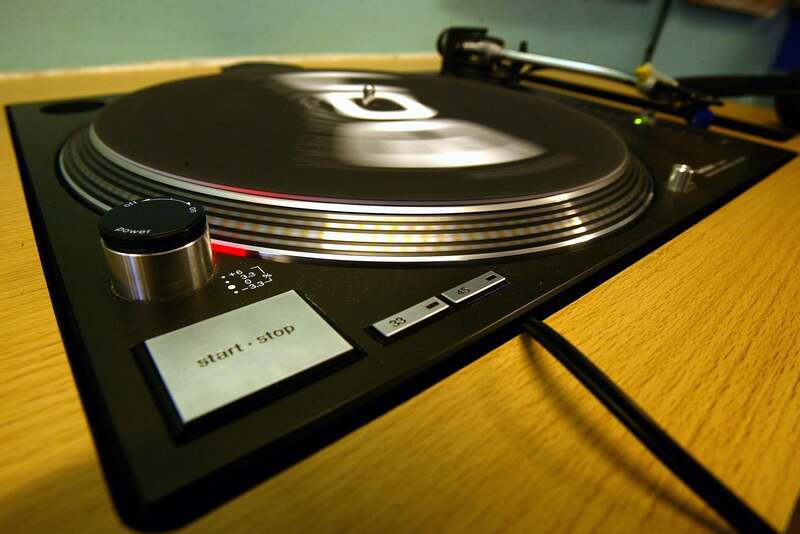 While Rebeat emphasised that HD vinyl records will work with standard equipment, if it catches on we would expect that some companies may attempt to make specialised needles that fit perfectly in these new grooves. Will we see a wave of HD needles and cartridges? If there's money to be made, then probably.